In a very real sense what occurs on the 12-12-12 is the Ascension, and what takes place on December 21, 2012is the Initial Birthing Solstice of the New Earth. That is because the ‘mechanics’ of the actual ascending process (that enables the Ascension) occurs on the 12-12-12. Accordingly it is what happens on December 12, 2012 that finalizes the activations and network-connections of all the Master Crystals, Crystalline Fields, Grid Points, Power Nodes, & Vortexial-Portal Sites to the Crysto-Sun Disc and 144 Grid. On the 12-12-12, for the first time, all of these crucial aspects combine, network and tie into the completed 144 Crystalline Grid. At precisely 12:12 pm from the Crystal Vortex, will the ascending energy merge and be tangibly felt. All will tie initially into the Crysto Sun Disc of Pinnacle Mountain located in the largest strata of Crystal on your planet, and then connect to the grid. We have told you before that the Ascension, the ‘New Earth’ is the expansion of your planet’s resonance into 12 dimensional fields. We have told you that the Ascension is purposed to expand the Earth and Humanity beyond the 3rd dimension, and burgeon into 12 dimensions. …the 5th thru 12th of which are in nonpolarity, zero point Crystalline Energy & integral One-ness. And that is the crystalline frequency. It occurs in the Crystal Vortex of the ARK because it is not only the largest strata of Quartz Crystal on your Earth, but also because it is composed of ‘seeded, coded’ & specifically placed ‘Master Crystals’ within a very unique geological matrix. There is logic in this you see. There is a master design taking place, and it makes sense ! You have indeed been here before, and it feels right, does it not? Kryon the Magnetic Master channeled to you a decade ago that evidence of Atlantis was in Arkansas. This will be discussed later in this channel, but we will say the mineralogical blend, the energetic cocktail that occurs in this area is extremely rare and it produces benefits and phenomena that your science does not yet recognize. We will say that the combined presence of crystal quartz, diamonds, radium waters, magnetic lodestone and gravitational anomalies is why the Law of One Atlanteans were in Arkansas. It is why the Crysto-Sun Disc is in Arkansas. Arkansas is the crystal-generator on the earthplane that opens the dimensional gates ! No place on the planet will vibrate with the incredible crystalline resonance on the 12-12-12 Ascension as powerfully as the Crystal Vortex. For we tell you the Atlantean Colony that Kryon spoke of in Arkansas was composed of the Atla-Ra, the Law of One, and they were there in what is now called Arkansas over 50,000 years ago planting the seeds and codes for the 12-12-12. They were there eons ago in an energy of 12 dimensions. In an energy of love and nurturing … and that energy is being turned back on. Masters, 2012 is just the beginning for the crystalline energy is amazingly robust and effusively dynamic. This benevolent energy is indeed a force of omnipotent ubiquity that has not been seen on the planet in many millennia. It is a powerful combination of telluric, hyper-dimensional and cosmic forces that are capable of shaking the earth and opening dimensions. It is also capable of up shifting your frequency. All of these are in fact occurring, and exponentially so, as there are dynamics of crysto-magnetic physics at play that are beyond your current scientific comprehension. It’s less than 6 months away! That is one of several reasons why so many of you will be drawn to Arkansas for the final Triple Date Portal gathering, the 12-12-12. For those of the Atlantean Law of One, the completion is part of a sacred oath that the Crystalline Energy would one day return…and never again be allowed to fall into the wrong hands. Presence in the Crystal Vortex for many is a soul contract, and many of the Law of One will feel & answer that call. We will also tell you that several of the featured speakers at the 12-12-12 including John Van Auken, Graham Hancock, Dr Semir Osmanagich, Tyberonn and John Jenkins were highly esteemed senior members of the Atlantean scientist priest, the Atla-Ra of the Law of One. All of their presence will add an immediately recognizable energy of sacred ‘reunion’, and that will be sensed and felt among all of the Atlanteans of the spiritual Law of One. And indeed several of these will be meeting for the first time, and will share the cognition very deeply. All who gather will feel a sense of exuberance, the magical knowing that what was promised millennia ago, will finally occur….the re-emergence of the Crystalline Energy. What will be experienced in the Crystal Gathering in Arkansas will be absolutely unique. At the moment of the triggering, a wave of incredible energy, an energy not felt on the earth for a very very long time, will sweep through the Crystal Vortex. It is what may be termed a standing wave. It will feel like ‘home’ to many of you, and you will weep in joy and recognition. At that instant the earth will shift into 12 dimensions. At that moment the 144 Grid will be fully completed…and we assure you, it is an energy you have never experienced in this lifetime. The 12:12 pm Trigger on the 12-12-12 will be the moment of the Planetary Ascension! It’s initial surge on the Earth will be at Mount Pinnacle. The Magnetic Master, Kryon, channeled a decade ago, that evidence of Atlantis is indeed in Arkansas. Arkansas, because of its crystal deposits was logically and absolutely an Atlantean colony. Crystals were seeded, programmed and coded. There remains in the vast chasms below the surface of Arkansas, ancient structures of the Atlantean era. These include a network of incredible tunnels, the remnants of a vast laboratory complex and what may be termed a hyper dimensional transport station. The latter of these is still maintained by the Sirian-Pleiadean Alliance. There are also ancient housing structures, some of which remain inhabited by what is termed the ‘blue-skinned’ race. On the 12-12-12, the two remaining dormant Master Atlantean Crystals will awaken. The Crystal of Thoth and the Ruby Fire Crystal. The former of which is located near Tiahuanaco, Lake Titicaca in Bolivia, the latter below Bimini. We will give a very brief description of both, and will provide, should the channel wish, a later channel with more in-depth exploration of these crystals. The Ruby Fire Crystal or Tuaoi is a far more complex design and much larger crystal. Unlike the other 8 Temple Crystals, the Tuaoi was not utilized in what may be spiritual purpose. It was originally utilized for the creation of the underground tunnels used for hyper dimensional travel and transport, having the ability to vaporize matter. It was also used for deflection in the earlier days of first Atlantis to deflect asteroids. Other versions of such crystals were in fact used in the exact placement of your present moon, having the capability of a ‘tractor beam’. The purpose for its activation is reparation. It will be regulated into balance at minimal function. It will be monitored, such that random erratic releases no longer occur. For the past 12,000 years it has randomly surged ionic bombardment of massive energy waves into the earth’s interior as well as the earth’s magnetosphere creating disturbances in space-time harmonics and imbalances in the gravitational field. The reparation will allow for the stabilization required in the New Earth by preventing damage from its uncontrolled discharges, you see. Uncontrolled these are capable of exacerbating tectonic movement and imbalancing crysto magnetic field harmonics that are necessary for the ongoing dimensional expansion. Do you understand? In time it will serve great purpose, but only when humanity is of a higher vibration. It is not a living conscious crystal in the sense of the Temple Crystals. The Tuaoi is inlaid with circuitry, and is more akin to what may be termed programmed intelligence. It will be brought into the network very slowly; the activation is purposed. Although the incredible crystals beneath the lands of Arkansas have been dormant for over 14,000 years, we tell you that they are awakening…and within the next 4 decades, after 2038 specifically, Arkansas will be globally recognized for its unusual and brilliant crystalline energy. Many Master souls of the Atla-Ra and indeed Masters of the Sirian-Pleiadean Alliance will purposefully choose to reincarnate in the Crystal Vortex, and in fact have begun doing so now. These are the Arcturian Crystal Masters, and Arkansas and Brazil are drawing them in the thousands. They are specialist in Crystalline Technology and will innately understand the importance of these two regions, and will thrive within, and play leading roles in the appropriate utilization of these potent energies of the Arkansas and Brazilian Crystal Vortexes. By the 23rd century, magnificent Crystalline Temples will have been built around the Crysto-Sun Disc of Pinnacle Mountain, and the Temple Crystal locations of Mount Maga, Wilhelmina and Eureka Springs. And while 3 centuries may seem a long time to you, it is but a flash from your nonlinear aspect. Indeed many tens of thousands of you of the Law of One, including the channel, will specifically reincarnate in that period, 15 of your generations from now. Now we wish to mention the importance of the Brazilian Crystal Vortex located near Sao Tomas de Letres in Minas Gerais. Indeed it is as important to the southern hemisphere of the planet, as is Arkansas to the northern counterpart. The two representing the most powerful crystal frequency on the earth. Both containing enormous crystal deposits. The reason the Arkansas Crystal Vortex is considered more influential is because two thirds of the earth’s land, and two thirds of humanity are in the areas above the equator, the northern hemisphere. But be aware that the two Crystal Vortexes, Arkansas and Brazil, are in correlated spin/counter-spin mode, and are necessarily counterbalances for the dissemination of the telluric portion of the crystal frequency. On the 12-12-12 this alliance will upshift, and the standing waves of energy within both will be amplified exponentially. So accordingly the activity of the Crystal Vortex will surge on the 12-12-12. This will increase throughout 2012 and continue to amplify annually until 2038. Long ago the ancient Mystery Schools of Atlantis contained a section of the Atla-Ra that programmed crystals with light & sound frequencies. The Crystals emitted a hertzian vibration field that was extremely beneficial. These were used for balancing the human field, enhancing health, healing disease, and for awakening into higher dimension. Some were also able to open an inter-dimensional channel to other ‘worlds’ and especially to the Divine Self. On December 12, the Temple Crystals are initiating a pulsed hertzian field that is capable of living ‘form’. This tangible energy interacts by induction with the human aura, and produces something of an altered state. The benevolent effect is akin to deep chanting, but understand that the waves produced are conscious, living, through the crystalline ‘conscious spirit’ of sound and light. The living energy is similar to that of an elemental field, but of higher resonance. It is more accurately defined as the consciousness of crystalline color and sound. It is projected from the ‘living’ crystals, you see….an aspect emanation of the crystals themselves. It is indeed the eventual recognition of this field that will motivate the construction of the Crystal Temples. The effect is myriad and prolific, and will powerfully influence the inner self, the higher emotions, higher harmonics of humanity within its energy reach. It is occurring now, and will progress from the 12-12-12 over the next seven years, forming a standing wave. This energy is Atlantean Atla-Ra technology and still exists in some of your ancient Temples in Egypt, Peru, Central America, Java, Cambodia and Newgrange in Ireland. All of your ancient Pyramids built to Phi, contained in their original construct such standing waves within specific and relatively narrow hertz bands. In a very real sense, the triangulation within the oval vortex of the Arkansas crystalline field will become what you term a crystal bowl. Within the bowl will be similar, somewhat fixed, yet varying pitches or notes in the hertzian wave-range.The differing ‘keys’ are determined by the indigenous mineralogical energies. For example, the area of Magnet Cove will have a differing tonal resonance than that of Crater of Diamonds or the Radium Waters. The same will occur in 2012 around the Crystals of Sound and Regeneration in Brazil, in Bahia and Minas Gerais, respectively. The crystalline standing wave will axialtonally join Arkansas to Brazil, (initially on the 12-12-12) and then envelop and bathe the planet by 2038. The effect will be the lessening of the ‘arc-swing’ of duality, by bridging the right & left hemispheres of the brain. The standing wave, when combined with meditation, moves through the prefrontal cortex of the brain, stimulates the pineal, and takes one into higher consciousness. There have always been certain places on the planet that became recognized as sacred. Stone Circles, Temples, Pyramids and Cathedrals were placed in these areas by the ancients. In the last two decades, your academics have been involved in studying ancient monuments, and have credible evidence that certain ancient monumental structures around the Earth have several common features. One of the most compelling is around standing waves. We tell you many of the structures were planned architecturally and designed acoustically to enable specific sound waves and frequencies that affect your energy field. These can indeed stimulate the pineal in humans of sufficient light-quotient and thus enhance multi-dimensional experience. We tell you that it is not simply the structures; indeed the structures are dependent to a large degree on the vector of placement and the mineralogy of the site. In fact, identical structures built in differing locations will have different tonal frequencies if the geological matrix, latitudinal placement and mineralogy differ significantly. The new emerging Crystal Vortex of Arkansas will be far more powerful and serve a different function than it did in the Atlantean era. This is why the Atlanteans placed the aforementioned three Temple-Crystals in Arkansas before the tsunamis inundated Poseida. The purpose and potency of these Temple-Crystals have created resonance that is far more ‘spiritual’ in aspect and effect. The addition of these three huge natural crystals will add their succinctly specialized conscious programming of knowledge, wisdom, healing and multidimensional awareness. And while their sheer natural attributes are quite capable of shaking the ground and bending the space- time continuum as powerfully as the infamous Fire Crystal beneath the Sargasso Sea in the area of Bimini, their regulation into refinement via the Sun Disc and Pyramidal controls will insure that they are kept in optimal benevolent purpose and balance. The Temple Crystals are alive, and indeed highly evolved, and will benefit the Earth and humanity in ways beyond your imagining. The quartz Crystals of Arkansas are imbedded with the energy and wisdom of what is referred to as the Atlantean Law of One. The Master Crystals placed there have frequencially transferred this vibration to the quartz indigenous to the area, and as we have explained, the Masters Crystals contain a higher dimensional alloy of gold conglomerate that has been received energetically by some of the natural occurring beds. The crystals from the McEarl mine carry this unique harmonic. These are especially potent. The Arkansas vortex is quite unusual in its movement. Most vortexes in the northern hemisphere of your planet spin in either ovaline or circular counter-clockwise flows. The crystal vortex of Arkansas has a very unique, very specialized ‘ to and fro’ vortexial motion. Moving approximately one-third of its circumference counterclockwise, and then rapidly reversing back in clockwise motion. This occurs in 3 separate arcs of 120 degrees. The forward and backward shift of this vortex is most unique, and is purposed in generating greater upward thrust of the crysto-magno-hydro energies. The energy of Arkansas has three succinct telluric forces that contribute to its tri-helixed field. These are the magnetic, centered in Talimena Ridge, Crystalline apexed in Mount Ida and the radium hydro-energy centered in Eureka Springs. 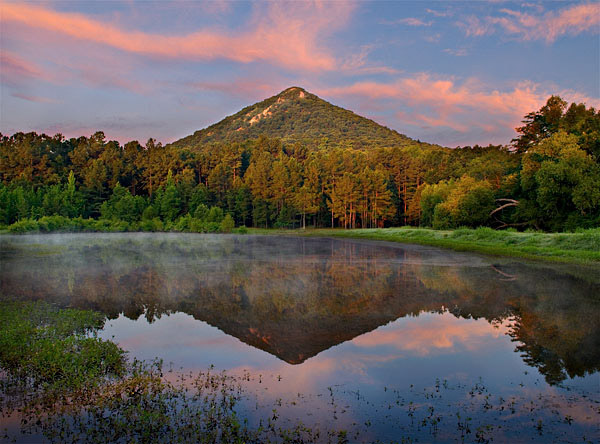 These make up the 3 discreet arc- gyros, which are regulated and tri-helixed through the Pyramids below Toltec Mounds and coded in the Sun Disc below Pinnacle Mountain in Little Rock. The unique pattern of the vortex generates the energy into incredible thrusts with both a receiving and transmitting manifold. Thank you Gillian for you work! What an honor it is to receive messages such as these.